Alan Greenspan, Gold Bug (2014 Edition)? Former Federal Reserve chairman Alan Greenspan gave a downright endorsement of gold as an unmatched currency during a talk at the Council on Foreign Relations. We added the (2014) tag because many have looked at Mr Greenspan's early missives and believed that he was a gold bug. But as is often the case with high ranking officials and public servants, what they do during their terms in office does not always reflect their (previous) views. And they often have their own versions of "Come to Jesus" moments AFTER they leave office and are suddenly able to see the light. Make what you may of this CFR sponsored discussion with Alan Greenspan. And so it begins. Official Wall Street forecasts for the price of gold should now start appearing in the sub $1000 range. The strength of the US dollar has seen gold, silver and other commodities hammered over the past month of so and this could very well continue into the near future. Bloomberg reports today that Georgette Boele of the Dutch (state owned) bank ABN Amro NV forecasts gold closing this year around $1,000 per ounce and continuing its decline to $800 per ounce next year. "Don’t try to catch a falling knife,” analyst Georgette Boele wrote in an e-mailed report received today. “The U.S. dollar rally has further to run, especially if the Fed turns more hawkish this year." If you follow this site, you would have read our story from last year where Jim Rogers presented a pretty good rationale in the summer of 2013, for why we are likely to see gold hit $900 (approximately 50% correction from the top) before it consolidated and went back up. So this drop in the gold price is all expected, right? "Gold Standard Not Possible In Welfare State"
There is an interesting article by Axel Merk on the Value Walk site recounting a panel discussion at the New Orleans Investment Conference from last Saturday. This conference featured the views of several investment professionals, newsletter writers, reporters, market commentators and one, Mr. Alan Greenspan - who made the prophetic comment which serves as the title of this entry. In a back and forth with Marc Faber, the former Federal Reserve Chairman lay the responsibility of the expanding welfare state on the United States Congress and their fiscal policies. Though Greenspan did not (and understandably so) comment on the current policies of the Federal Reserve, the "Maestro" provided plenty of, one assumes candid and certainly typical Greenspanesque, opinions to question fielded during the panel discussion. If you happen to be in Singapore and have an urge to purchase a PAMP Suisse gold bar or two, you can swing by a brand new gold dispensing ATM to get that immediate gratification. 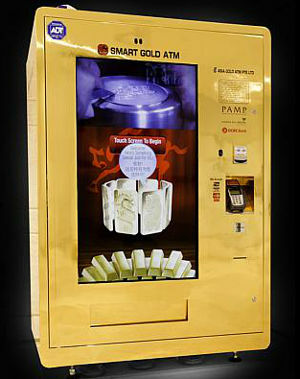 Two "Smart Gold ATMs" were installed at the Resorts World Sentosa and Marina Bay Sands, earlier today. This initiative is being lead by a local company from Singapore, Asian Gold ATM. Their ATM will dispense gold bars/pendants ranging from one gram to one ounce which will be priced based on the daily global price of gold. Hope these ATMs are well anchored into the ground with adequate security around. Have you picked up your Italian Job style gold bars? 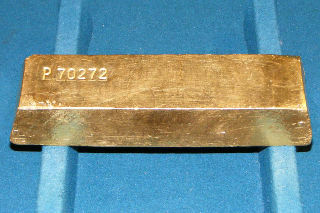 "The number of 12.5kg gold bars being bought by wealthy customers has increased 243pc so far this year, when compared to the same period last year, said Rob Halliday-Stein founder of BullionByPost. "These gold bars are usually stored in the vaults of central banks and are the same ones you see in the film 'The Italian Job'," added David Cousins, bullion executive from London based ATS Bullion." Not all gold and silver bullion/coins are created equal. Literally. We have long known that there was a robust fake coin manufacturing industry in China and even high value gold bars have found to be filled with tungsten. So gold and silver investors and collectors need to aware that there are many fake coins and bars floating around. Many of these fake coins are being sold as "souvenirs" but the price increase over the last 10-15 years has made this a very profitable criminal enterprise. Silver.com has put together an informative video and infographic to teach us how to detect and avoid these counterfeit gold and silver bullion products. There are many gold and silver prognosticators out there, with many calls on future prices, but this interview of Harvey Organ by Greg Hunter of USAWatchdog.com was bolder and more provocative (some may say ridiculous) than most. His explicit call for $3,000 per ounce gold and $200 per ounce silver by the end of this year (with big spikes up after that in 2015) may be music to the gold and silver bugs ear, but you have to ask whether this is just re-enforcing the bias/view you already hold about gold. I'll give Greg credit for pushing Harvey to explain how he gets the number, and though there is some rationale in this 30 minute interview for potential physical shortages, the end number is purely arbitrary. You watch the video and make up your own mind. There was much "hope" that the incoming Narendra Modi government would ease up the gold import restrictions but if the new finance minister Arun Jaitley is to be believed, restrictions on gold import are likely to remain in place. "Each step is being continued...efforts are being made to continue each of these steps," Jaitley said while referring to measures taken by the UPA government last year to contain Current Account Deficit (CAD) that touched a record high of 4.7 of GDP or $88.2 billion in 2012-13. "The measures taken by the government and the RBI helped contain India's current account deficit to $32.4 billion in 2013-14 and build up foreign exchange reserves to a level of $316.4 billion on July 4, 2014," Jaitley said in reply to questions in Rajya Sabha."